Tulips make wonderful cut flowers ,they also look good when made with stockings or nylon ! 1 Make three big hoops or rings by wrapping golden wire round a bottle (see tutorial ) and cover with nylon,tie with thread. Give a slightly oval shape (3" long) to the petals by pulling the top end of the hoops. 2 Make three smaller hoops similarly(2 1/2") for petals. 3 Tie each large petal to the hooked stem wire with thread upside down i.e the petals will be facing downwards and the tied ends will face upwards, like a skirt ! 4 Next tie the smaller petal hoops on top of them similarly. 5 Tie stamens and pollen stems to the centre (optional) or wrap up the centre with nylon and tie with thread. 6 Slowly turn up each smaller petal upwards, giving cup shape to them. 7 Similarly turn up the larger petals too giving a natural tulip shape to the flower. 8 Wrap green tape to the stem. Make a large hoop, wrap it in green nylon ,tie it with thread. Gently pull it out . Tulips have long sword-like leaves. 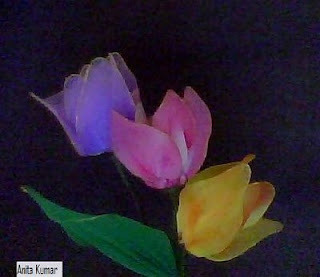 Make several tulips and leaves in the same way, put them in a vase , enjoy !